First, there was the blog…now there’s a book. When I was putting together a collection of my travel stories in book form, I couldn’t decide on a name. Then a smart friend suggested that it was staring me in the face: A Glass Half Full and other travel stories. I am so excited to have in my hand at last a published collection of my own stories. While I’ve been a contributor to several travel anthologies over the past 10 years or so, there’s never been a permanent record of my stories – and I’m over the moon with how it looks! Thanks to clever Brisbane graphic designer Megan Taylor, each chapter opens with a little line drawing – and her cover (based on an idea by my friend Julie McGlone) makes me smile whenever I see it. The book is not a collection of stories from this blog; it’s made up of writings – both published and previously unpublished – from my travels in recent years (and some not so recent). Some have found their place in the travel pages of a number of (mostly Australian) magazines and newspapers; others, including my account of crossing the DMZ between North and South Korea in 2003, have never been published before. Some were written – or adapted – specially for this collection. It was a big thrill to see it on display at the recent Margaret River Readers & Writers Festival in Western Australia last week, where I was a guest speaker on several interesting discussion panels – and to sign copies for those who bought it. I had a lot of fun re-living some of my most memorable travels. I hope readers will enjoy it too. 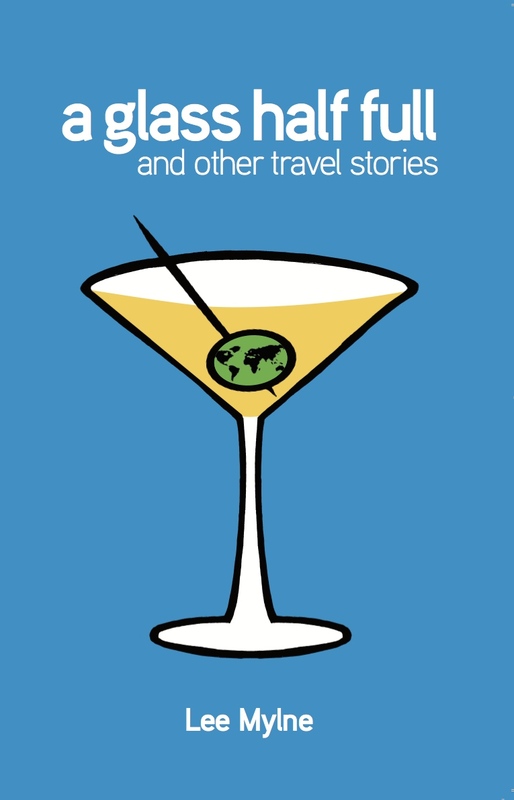 A Glass Half Full and Other Travel Stories is available through Vivid Publishing (overseas orders welcome too!). Congratulations Lee, what an amazing achievement! You are in it, of course! Thanks for being part of the journey(s). Congratulations, Lee! What an accomplishment! So wonderful to know that this is something no-one will wrap their rubbish in (or put in the recycling bin!). You are gradually filling the glass half full to overflowing. Good for you. I am doing my best Tommy. My author photo is one you took – thank you! Absolutely fantastic! Can’t wait to buy a copy. Thank you! All sales much appreciated! This is wonderful! I’m sure it’s a delightful book. You must be so proud. :) I’ll have to get my hands on a copy, too. I think it would be the perfect book to read while traveling. Congratulations, Lee. Do you know if I can get a copy here in Canada or do I have to order on line? I hope sales go well for you. Thank you Carol. You would have to order it online through the link in the post. But overseas orders are very welcome! Congrats Lee, what a wonderful way to not only celebrate years of your labour of love, but also keep it all in one place for future generations to dip in to. Thank you – and yes, much better than having the newspaper or magazine tossed in the recycling bin! I began your book by ‘dabbling’ in the places that were where I had been (Does that make me a Dabbler he asks?) and found your eyes saw so much different ‘stuff’ to mine. This led me to then reading the rest of the stories which I enjoyed immensely. I congratulate on a book well done and for allowing me to journey with you. My glass now overfloweth! THANKS!